OMG Posters! » Archive "The Smoke Monster" Lost Art Print by Ken Taylor - OMG Posters! This is probably my favorite print from the viral Lost series yet. 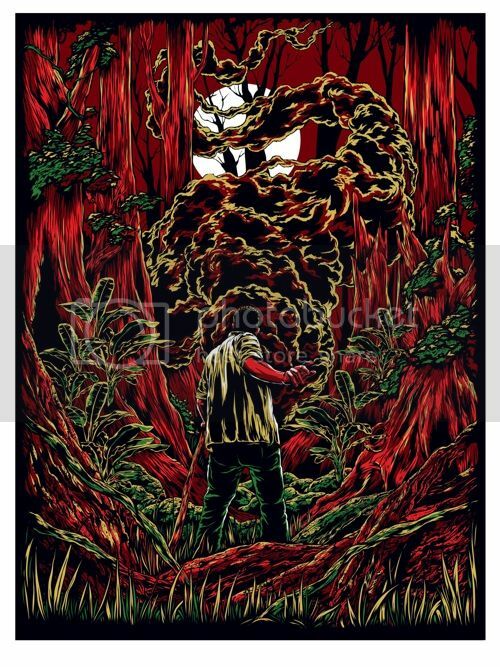 Ken Taylor’s “The Smoke Monster” is an 18″ x 24″ screenprint, has an edition of 300, and is $50. Some of these prints have been known to sell out pretty fast, so don’t wait around too long. Visit IAmTryingToBuySomeJerkeyAndASlushy.com. awesome…..probably my favorite yet. still don’t know if i’ll buy any of these. It’s good to see these getting better. Hope there are more of this caliber to come! Yeah! This is much better! I hope they continue on an upward swing. Dang, I waited too long to pull the trigger. Great work though Ken, this is definitely one of the best of the series. This series is turning out so damned cool! Ken’s work is always super good, and this print is no exception. Really great print.